who loves the rain, who cares that it makes flowers? Those of you who follow me on twitter will know that I’ve just speed-ordered (thanks, Amazon) and speed-read (couldn’t-put-it-down-obsessed) David Nicholls’ One Day. And also anyone who knows me will know that I’m a sucker for anything a bit Brit-flicky/rom-commy/mushy – so the book was right up my street. But on a serious note, I did think it was great; so easy to read, so addictive, very subtle in places, I laughed out loud a number of times and I also cried (sobbed), I love a good bit of 1990s social/historical context (in other words, a bit of Britpop), and the characters were entirely realised. And yes, I am going to watch the film; it won’t be as good as the book BLAH, but Jim Sturgess will make up for that in swathes, I’m sure. But yeah, read the book (and weep). In other news, I bought some sunflowers a couple of days ago. They have DROOPED. Word has it that I shouldn’t have cut them, or that I should’ve cut them more so the vase could support them, or that I should’ve wired them (seriously – who would think of that?). But it’s nothing that a piece of string can’t sort out (if I had some string). For now though, I have droopy sunflowers (if it’s good enough for Vincent, it’s good enough for me). Oh, and we have cushions with buttons! I sewed buttons onto our massively dilapidated cushions, so they now have 16 out of 16 buttons as opposed to 2. Good. Must dash to work. By the way, my London photos are being developed, so restaurant/cocktail reviews will be winging their way to you shortly. 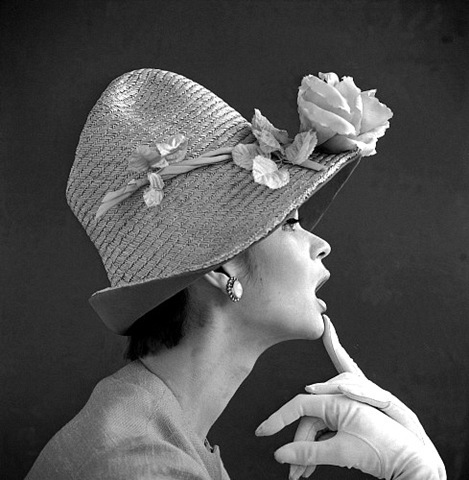 As for this photo, it’s tenuously linked by the fact that she’s got a flower on her hat. Can I get away with that?